As Messer Gardner was the Engineer who secretly designed Uncle Chopper’s (Ken Tyrrell) very first F1 racecar – no less than in his own garage! After having begun his Formula 1 career as a Transmission specialist for Harry Ferguson, developing Matra’s four wheel drive system during the ’69 season. This was during the time that Ken Tyrrell was running customer March chassis as the Matra International Squad that had won both the Drivers & Constructors championships the year prior for the French manufacturer with The ‘Wee Scot; Sir Jackie Stewart at the wheel. Gardner’s Tyrrell’s 003 & 005/006; evolutionary designs of the original 001 chassis would take JYS to his second & third World Championship titles in 1971, 1973 before Stewart walked away from the sport. 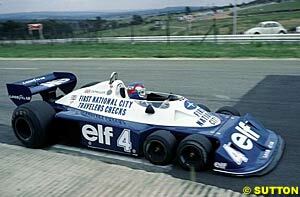 Yet Derek’s most revolutionary chassis, which I see is now being called iconic – is without doubt my most favourite Tyrrell of all time; those wild P34 Six-wheelers that caused quite a stir upon their debut back in 1976 – their most successful season, when Jody Scheckter led Patrick Depailler home at Anderstorp to a historic 1-2 finish in the Swedish GP!